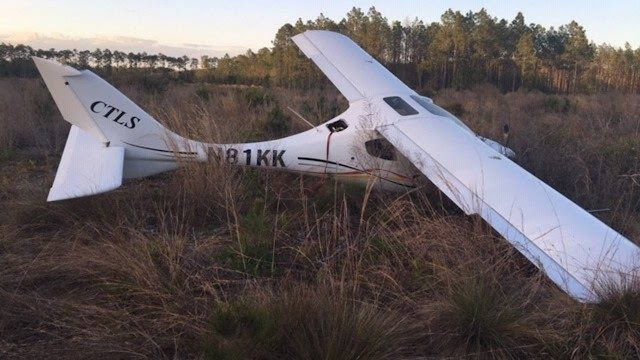 On March 30, 2019, about 1700 eastern daylight time, a Flight Design CTLS airplane, N81KK, was substantially damaged following a total loss of engine power and forced landing at Palatka, Florida. The commercial pilot and one passenger sustained serious injuries. The airplane was substantially damaged. The flight was operated by the pilot as a Title 14 Code of Federal Regulations Part 91 personal flight. Day, visual meteorological conditions prevailed near the accident site, and no flight plan was filed. The flight originated at Hilton Head Airport (HDX), Hilton Head, South Carolina about 1500 and was destined for Palatka Municipal Airport (28J), Palatka, Florida. According to the pilot, the engine abruptly lost power while north of 28J. Unable to restart the engine, he set up for a forced landing in a clear area near a landfill. He pulled the handle for the ballistic parachute system. The rocket fired; however, the parachute remained in its container. The airplane landed in a nose low attitude and the occupants were met by first responders. Structural damage was found on the lower and aft fuselage and at the wing tips. The wreckage was retained for further examination. BOSTWICK, Florida - A small plane went down in woods near a landfill, injuring two people, according to the Putnam County Sheriff's Office. Deputies said the two people on board were reported alert and conscious but suffered from back injuries. News4Jax was told they were taken to Orange Park Medical Center Trauma Center. No word on the identities of the passengers on the plane or where they were heading. The Florida Highway Patrol is handling the investigating into the cause of the plane crash until the National Transportation Safety Board can take over.